Archives for posts with tag: whatever happend to Willie Rushton? Hello, Good Evening, and Welcome. Tonight we shall be taking a look, with the help of this picture, through the home of a famous arachnid. All you have to do is watch, and tell us who that is. Whelll this is everyone’s idea of a fine countryside retreat, isn’t it? The building work is clearly inspired and defined by the natural architecture of the rural surroundings. The material used here is interesting as although the structure is strong and rugged, the interior feels as soft and snug as newly butchered seal puppy fur. Clearly this mixture of practicality and comfort is important to the owner. The uniqueness of this creation all come from one mind, as our occupant claims to have thought of, designed and built it all themselves. Maybe they have a large extended family, as many hands make light work. As we cross the threshold the eye is immediately drawn to the amazing decor. Clearly not one for pandering to popular fads or style gurus, our owner has strewn their past, future and present meals around every available wallspace. If we delve deeper we can see they must be a fan of all things insect, because who else would keep the dried out carcasses of dead flies on their living room mantelpiece? As we follow the mesmerising spiral down into the belly of this beastly abode we brush past the discarded leaves and seedheads the wind has brought in through the open door. This owner doesn’t appear to be one for keeping a dustpan and brush nearby. In fact a look round the kitchen cupboards and I can’t find a single household cleaning product. Maybe their traditional roots mean they just make do with spit and polish here. Finally we shall retire to the garden, which as you can see is both enormous and neglected. The lawn here clearly hasn’t been cut in weeks, and the nettles appear to have been left to thrive in any place of their choosing. But look slightly closer and you can see that under the anarchy here there is order. There are small paths, well trodden, which run amongst the haphazard borders. Our owner may be no Capability Brown, but don’t be fooled by the lack of finesse as there is evidently a mind of high renown at work here. So, let’s look at the clues. Many hands make light work. The spit and polish in the kitchen. The carcasses of dead flies on the mantelpiece. 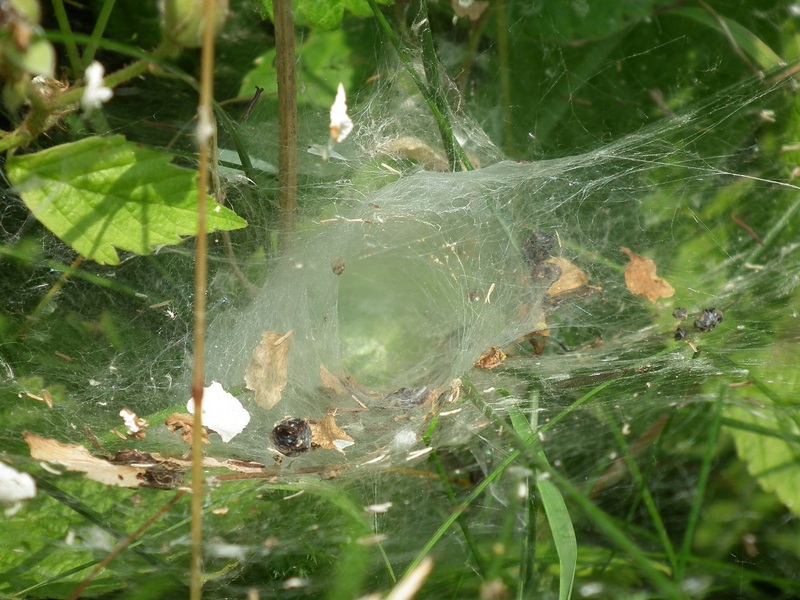 Who lives in a web like this? Meta-Presenter, it’s over to you. Well thankyou very much indeed Freakishy-Accented Narrator, and now for our home and studio audience, though not for our panel, here’s. Whose house. It is. Scaryness: 7. Everyone claps and nods their heads, even though they’ve never heard of them. Tags next week I shall be writing a Going For Gold parody, showing my age, spiders, this will all mean nothing to anyone outside the UK, this will all mean nothing to most people inside the uk either, Webhole was the best I could think of apparantly, whatever happend to Willie Rushton?